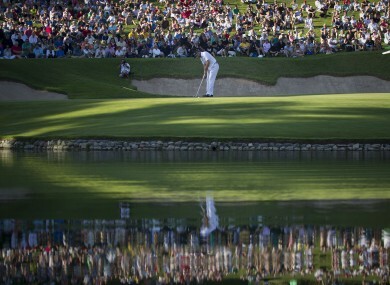 Sergio Garcia putts on the 17th hole during the final round of the Andalucia Masters at Valderrama. 2011 WAS A great year – a year of change and variety. We witnessed four players win their first Major Championship and saw three different players at the top of the world rankings. The highs and lows have been documented and analysed in this column and as the festive season approaches, it’s time to look back at 10 of the big winners of 2011. This was undoubtedly Donald’s year. The last few weeks have been dominated by his quest to win the money list on both the European and PGA Tour, which he completed in Dubai, the first accomplishment of its kind in golf. He picked up four wins along the way, and pretty big wins at that – the WGC Accenture Matchplay, BMW PGA Championship, The Barclays Scottish Open and the Children’s Miracle Network Hospitals Classic. That’s a lot of silverware to have in the cabinet and Donald will be reflecting on his best season ever wondering how he can possibly improve on it next year. One of his main goals for 2012 must be to win a Major. I nearly didn’t believe it when I looked back through the records and saw that Thomas Bjorn had won three times this season. For those wondering, he won the Commercialbank Qatar Masters, Johnnie Walker Championship at Gleneagles and Omega European Masters in Switzerland. It’s an incredible achievement really for the man who turned 40 this year. Ìn fact, his European Tour earnings of just over €1.8million was the most he’s ever earned in one season. His career is often remembered for the 2003 British Open where he took three shots to get out of a bunker on the 16th hole on Sunday, leaving the door open for Ben Curtis to win, but he has shown this season that maybe he’ll have more Major opportunities. He’ll certainly be inspired by Darren Clarke this year. This was really a breakthrough year for Rory McIlroy. We all knew he had the talent, but he showed immeasurable mental strength on top of that talent this year. He went from being a talented youngster to a serious player. The final-day nightmare at the US Masters would have been enough to see a lot of men off and not come back. The fact that he did come back and won the very next Major shows just how big this man is. The win at the UBS Hong Kong Open capped off the season nicely, and added further weight to everyone’s belief that McIlroy is on his way to becoming a serial winner. It would be no surprise if 2012 was another big year for McIlroy. We all knew Darren Clarke was an extremely talented golfer, but probably very few of us thought he was going to win a Major at this stage of his career. When he lifted the Claret Jug, there wasn’t a soul who begrudged him what was a much-deserved victory. Sure, he rode a bit of luck along the way, but what Major winner hasn’t? As much as he deserves to rest on that victory for a long time, professional golf doesn’t work like that and 2012 will bring new challenges for Clarke, who struggled a little for form in the latter stages of the season. The first Major winner of the year, Schwartzel is definitely the type of player who you feel can go on and win more. You’ll remember that he finished with four birdies in a row to separate him from the close bunch at the top – that’s a seriously strong finish. His record in the subsequent Majors of the year was also very convincing. Ninth at the US Open, 16th at the British Open and 12th at the USPGA Championship. That’s the kind of display that suggests he will contend for a Major again before long, and he has the best possible experience to draw upon with that four-birdie finish. Keegan Bradley was pretty much unheard of until this year, but his win at the USPGA Championship wasn’t just a one hit wonder – he also took home the Byron Nelson Championship. Rookie of the Year Bradley, still only 25, really couldn’t have asked for more from his first season on tour, but his challenge now will be to consolidate and build in 2012. What that means at this point isn’t exactly clear. Even though he won a Major, we don’t know a huge amount about him, how good he really is, and what he should realistically be expecting to achieve next year. Certainly one to keep an eye on though. Webb Simpson was the man who almost denied Luke Donald his PGA Tour money title. A great year for a guy who had never even won on tour before. Simpson is one of these solid players who you feel will regularly be in contention in the future. At 26, he’s young enough that he can build on his experience and improve his game year by year. This season will certainly give him huge confidence going forward. Martin Kaymer is one of the classiest golfers out there. He’s a joy to watch and he’s a real winner. After such a fantastic 2010, he lost his way slightly in 2011 when he felt he needed to change his game for the US Masters, but he has come good again in the latter part of the season. His win at the HSBC Champions event just recently will give him huge confidence going into next year and I’m expecting big things from him in 2012. It really warmed the heart to see Sergio Garcia win again; to do it two weeks in a row was a bonus. Garcia has been one of the best ball strikers in the world throughout his career, but when he took a break from the game you would have been excused for thinking maybe the game had got the better of him mentally. To win twice in his comeback season was massive. Even though it seems like he’s been around for an era, he’s only 31 years of age and has almost everything he needs for next season and the years ahead to be fruitful. Micheal Hoey isn’t the most high-profile of tour players, even in Ireland his limelight is taken somewhat by the likes of McIlroy, Graeme McDowell and Padraig Harrington, but 2011 was an amazing year for him. He picked up two wins and earned a total of just over €950,000. It was his best year ever by a country mile. He might find it difficult to repeat two wins again next season, but he can look back on 2011 with great pride and the exemptions that he has earned from those wins will give him great comfort going forward. See more articles by Neil Cullen. Email “In the swing: golf's big winners in 2011”. Feedback on “In the swing: golf's big winners in 2011”.